Delve into the wonders of Chile. 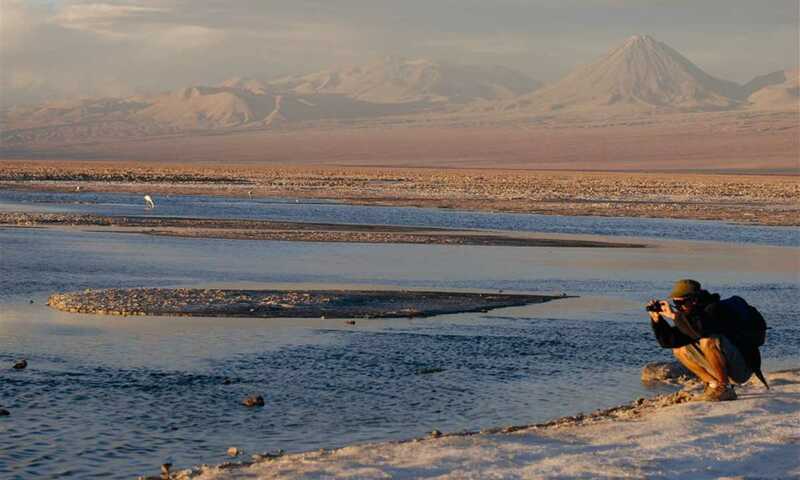 More than a tour of the Atacama, this trip will also teach you about the importance of the area to astronomy, and about previous civilisations of the area. 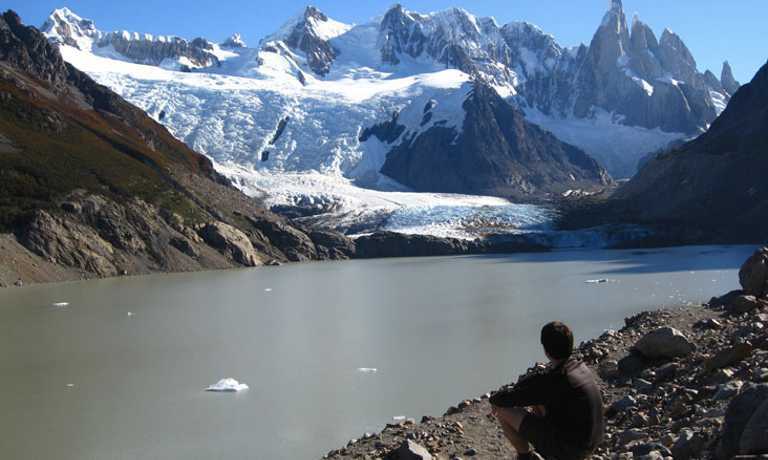 You'll then set off on the classic trekking route in the heart of Patagonia. Fully customisable to your wants and needs. Afternoon: Trekking to Moon Valley Departure will be at 16:00 from the hotel. After 35 minutes by car, we will arrive at our starting point, going into an unknown gorge, advancing through a maze of saline formations, where your mind will certainly discover amazing shapes. The route will lead us ascending to the summit of the Great Dune of the central crater of Valle de la Luna. Here we will wait for the sunset, contemplating a marvellous view of the valley and the Andes. Finally, we will descend towards the car, which will take us back to San Pedro. Night: Astronomic Tour This tour is made by a French engineer specialized in photography, with a wide experience in astronomy, working as a scientific photographer in Costa Azul Observatory (France), Observatory Palomar of California (USA), La Silla Observatory (Chile). He settled a year ago with his agency, making sky observations, in a privileged and unique place in the world to do so, like San Pedro de Atacama. The tour starts with an explanation of geographic facts, main constellations and their historic and poetic significations. Then we make the observation of the sky through big and high quality telescopes. Morning: Tambillo- Valle de la Muerte (Death Valley) We will travel towards the ayllu (shelter) at Catarpe, continuing up river to start the trek at Tambillo. We will ascend the Cordillera de la Sal through an old path used by muleteers until we get to the summit. The road continues through a long ledge, on which we will trek almost for two hours, having an impressive view of the valley of Rio San Pedro, Tambo Inca, and the Andes Mountains. Then we will descend some steep dunes towards the heart of the Valle de la Muerte (valley of death), where a car will be waiting to take us back. Afternoon: Visit to the Archaeological Museum, Pukara (fortress) of Quitor and Tulor Village We shall visit the archaeological museum Gustavo Le Paige, to become familiar with the Atacamenian, Tiawanaku and Inca cultures and population (settlements). Later on, we will continue our trip towards the Pukara (fortress) at Quitor, ending with a visit to the Tulor village, dated around the year 800 BC. This excursion requires a full day of exploring. Departure is at 8:00 a.m., travelling towards the south, going first through the village of Socaire, where we will observe the ancient agricultural tradition of terraced plantations, and its beautiful church from the XVII century. Then we will ascend to 4.200 meters, to the Miscanti and Mi?iques lakes. Here we will take a rest, while an aperitif and buffet lunch is served. We will then continue our trip towards the Aguas Calientes Salt flats, and finally to the Tuyaytu lake. During the trip, various types of Andean high plateau birds and animals can be observed. The return trip will start at 17:00 hrs. Morning: Geysers of the Tatio, Puritama Hot Springs Departure is at 4:30 a.m. along the way you will enjoy sunrise in the high plateau, and observe birds and animals moving peacefully around the area at that hour. Around 7:30 a.m. we will arrive at the geysers of El Tatio, where great steam columns of up to 6 meters rise up from the ground. A spectacle not to be missed. On our trip back to San Pedro, we shall stop at the Puritama hot springs, to take a well-deserved bath at 35 degrees (Celsius), surrounded by great reeds and the infinitely blue sky. Here we will also enjoy an appetizer. For this excursion we advise you to wear very warm clothes, take a lighter set of clothes for when the sun comes out, and a swimsuit for the hot springs. Morning transfer from San Pedro de Atacama to Calama airport (one hour by private transfer). 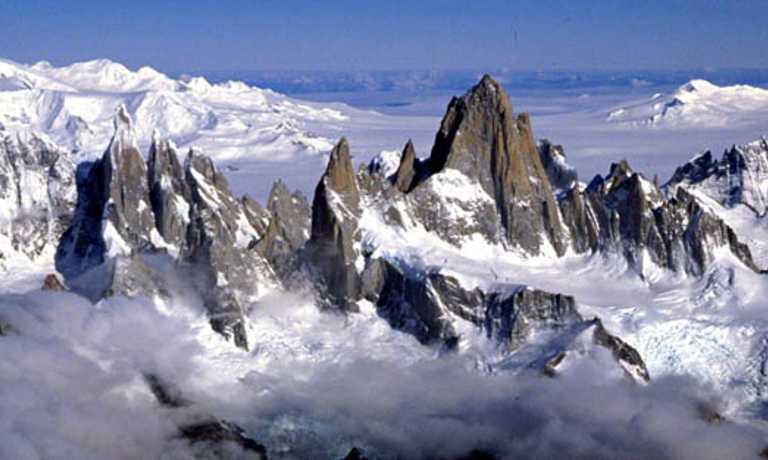 Fly via Santiago to Punta Arenas airport. Stay in Punta Arenas overnight. Early morning bus to Puerto Natales. Private transfer to Torres del Paine at midday, taking you through open pampas and huge ranches (estancias). Chances are we will be able to observe one of the most typical animals in this area, the nandu, (rare South American ostrich). We will follow an unpaved road heading to Refugio Las Torres to spend our first night. Upon entering the park we will have excellent photographic and birding opportunities as we drive alongside lagoons frequented by Chilean flamingos and black-necked swans. Today's hike is on a gentle trail following the border of the park and offers opportunities to see guanacos (Llama family) and the Andean Condor. We will start our first day trekking to the base of the Towers, following the Ascencio River to enter the Ascencio Valley. Our walk will be uphill for one hour before stopping to observe the first glimpses of the valley surrounded by unbelievable beech forests (Nothofagus family), glaciers and waterfalls. We'll continue through the valley for another hour and a half before ascending a huge terminal moraine to a lookout (900 M), excellent for picture taking. At this point we will be surrounded by three giant granite towers (2850 M) and a lagoon with slurry waters due to erosion produced by glaciers. This amazing view will be accompanied by lunch to add to the enjoyment. After being awed by the towers we'll start our descent, following the same path back to the hut. 500 mts. difference of level, 5 hours, 11 kms. We will start early morning to enjoy, weather permitting, a magnificent dawn filled with orange-pink colors. As we leave the campground we will arrive at Inge lagoon. Chances are, on this path, we may see the flight of an Andean condor or eagles hunting hares or small rodents. We follow a well mark trail ascending around (200 mts.) from the base of Almirante Nieto Mountain (2750 mts. ), crossing the Bader River to arrive at Refugio Los Cuernos where we will stay overnight. We will begin early morning with our hike to the Grey Glacier. Initially ascending 200mts up a winding narrow path leading us to Laguna Negra, a place where we will observe the first glimpses of the South Patagonia Ice Field with its many unclimbed mountains. We will advance through forests and rivers, with possible sightings of spectacle and flying steamer ducks, up to the glacier viewpoint. 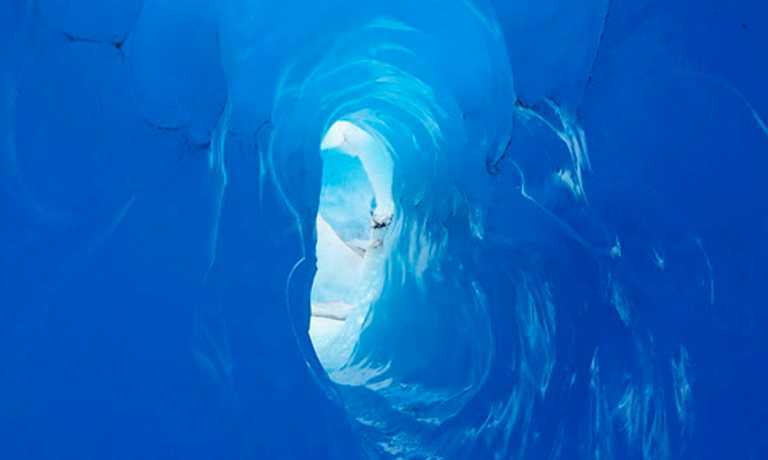 We will have lunch at this place to see, if we are lucky enough, ice calving from the huge glacier wall. Right after lunch we start an exciting adventure by boat. We will navigate for a while in front of the glacier in the hope of seeing icebergs calve. Our return journey offers views of Paine Grande with its impressive ice mushrooms and we sail through icebergs of different tones of blue. Then we will take a transfer back to Puerto Natales. This trip can run as a group trip, with prices starting from $3,590 per person for a complete group. If you are looking to join a group or you are a solo traveller we will help to form likeminded groups of travellers. Please let us know your travel plans. Price of USD $3,590 per person is based on a group of 2 people. Discounts are available for larger groups.